cairnswk wrote: ndrs...this is starting to look really good...but i'm afraid i don't quite get the feeling of the branch on the end of the title. It's an interpretation of a generic bush-type growth, and aims to represent PNG as a fertile region. Mmm, then perhaps you'd consider doing something other to show this, i have to agree with Koontz1973 that is looks like an after-thought and is totally out of place where it is hanging off the A. While it is in the style of the map i think it's misplaced. Sorry. Perhaps you'd consider the national symbol (google it) for inclusion in your style. cairnswk wrote: Mmm, then perhaps you'd consider doing something other to show this, i have to agree with Koontz1973 that is looks like an after-thought and is totally out of place where it is hanging off the A. 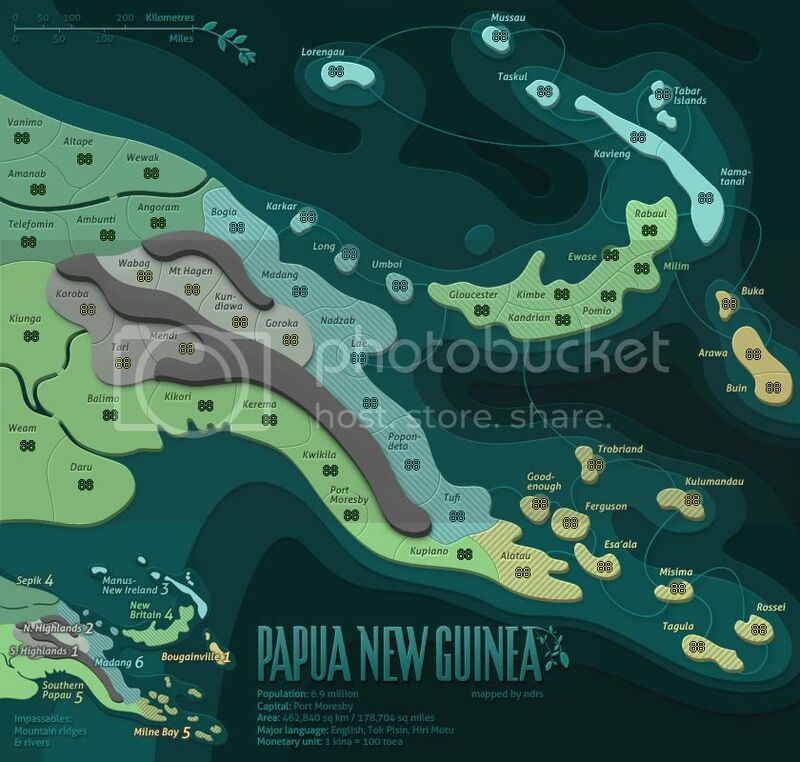 While it is in the style of the map i think it's misplaced. Sorry. To be honest, I wasn't looking for it to have a deeper meaning, mostly I just wanted to make the map less sterile and make the logo more unique. I think what I comes down to is whether you like it or not aesthetically – and I do. Would it look less out of place if I added an additional decoration? Last edited by ndrs on Wed Jan 04, 2012 4:00 pm, edited 1 time in total. ndrs wrote: Because some numbers wouldn't fit on the islands – especially on the small map to come. No, it looks weird to have army circles only on some territories. It doesn't matter if a pixel or two doesn't fit in the island. Just center the numbers so that most of it is inside the island. In most situations there will only be one number on them anyway, and if the 3rd number is outside the island it's still better than having all the numbers there. I'm afraid i have to say it simply looks weird hanging off the letter/line. my vote is no for both pieces of branch. I think they are both fine, I like 'em. My guess this is probably one of those areas where the cartographer can really have final say, . The one on the title is fine, but I'd remove the one in the scale graph - it just looks weird. Another option if you wanted to keep them in, would be to remove them from the title and scale, but place a slightly larger / nicer image in the top right corner. Right now, that is a huge black spot with nothing in it. Look at Golfe Du Saint-Laurent and Pirates and Merchants (drafting room) for the idea. Not done in there styles but to give you some ideas on nice corners. I don't think the upper right corner needs anything. The balance of the image is fine as it is, the upper right corner doesn't have much space and adding stuff there would make it cluttered. It's a little bit of work but I'll make it happen if others feel the same way. cairnswk wrote: I'm afraid i have to say it simply looks weird hanging off the letter/line. my vote is no for both pieces of branch. AndyDufresne wrote: I think they are both fine, I like 'em. natty_dread wrote: The one on the title is fine, but I'd remove the one in the scale graph - it just looks weird. koontz1973 wrote: Another option if you wanted to keep them in, would be to remove them from the title and scale, but place a slightly larger / nicer image in the top right corner. natty_dread wrote: No, it looks weird to have army circles only on some territories. Thanks Natty, will change it for the next update. Last edited by ndrs on Sun Jan 08, 2012 10:36 pm, edited 1 time in total. 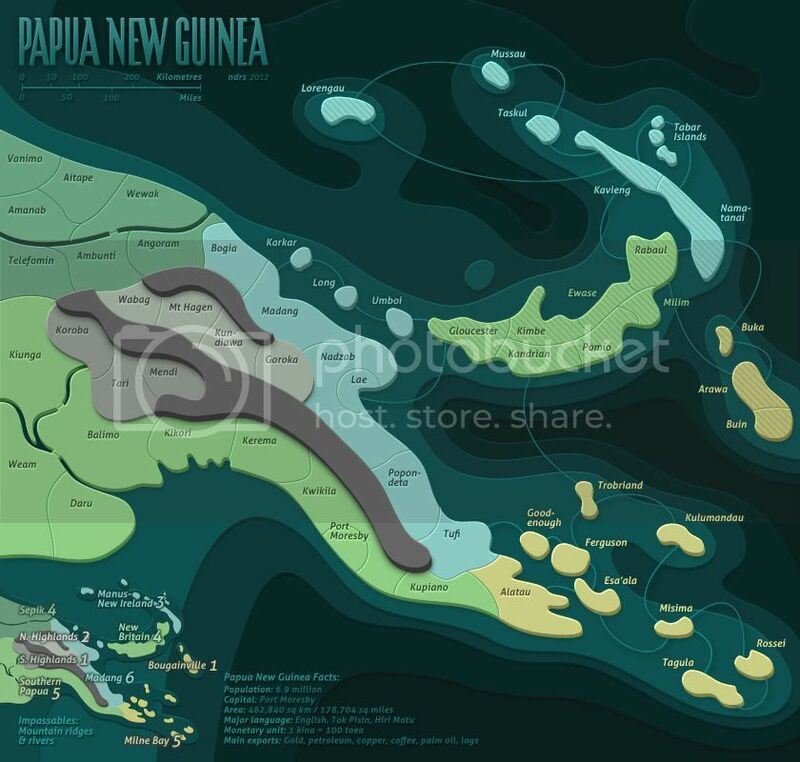 Southern Papau --> Southern Papua? The stats are very hard to read. Can you bring them out some more. I'm also up for the branch only on the title. Let me say that this map looks really beautiful. J_Indr wrote: I'm also up for the branch only on the title. Since it seems like we're voting on this, let me say that I agree. I like the branch on the title--not sold on it with the scale. koontz1973 wrote: The stats are very hard to read. Can you bring them out some more. They could use a touch of clarity. But overall, I'm quite liking this map. Victor Sullivan wrote: Southern Papau --> Southern Papua? Peter Gibbons wrote: Since it seems like we're voting on this, let me say that I agree. I like the branch on the title--not sold on it with the scale. The people have spoken!! The verdict seems to be; Scale - No, Title - Yes. Are you talking about the small and large map? I decided to not scale the stats text on the small map so that I wouldn't have to down scale the title. I'll test some things to see if I can make the stats clearer on both maps. ndrs wrote: Are you talking about the small and large map? Both maps. I can just read them but it is hard. Last edited by ndrs on Tue Jan 10, 2012 9:10 pm, edited 2 times in total. Thought crossed my mind... might it be worth swapping colors between Manus-New Ireland and Bougainville? It seems pretty obvious by the connections, but someone playing the map for the first time might initially think all the yellow islands are part of one bonus if they don't read the legend carefully. Swapping those two bonus colors would prevent that. It would also distribute the color balance a little more (though I only think that will look better... it might not in the end).